On Easter Monday 1916, sixteen hundred men, women and children went out to fight for an independent Ireland. The battle raged in Dublin for six days and resulted in 485 deaths and the destruction of many parts of the city. 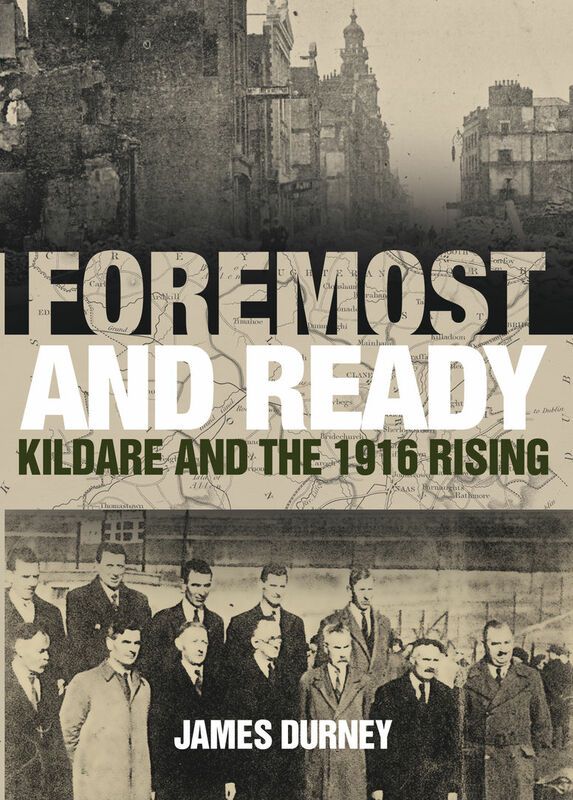 While predominately a Dublin affair, many of the Volunteers were from outside the capital; twenty-four Kildare men and women took part in the Rising, including twelve out of the fifteen men from Maynooth Company, Irish Volunteers, who walked from Maynooth to the General Post Office. Nine Kildare natives were killed in the Rising, while dozens more were wounded or imprisoned in the aftermath. Chief financier of the Rising was Kildare-born John Devoy, leader of Clann na nGael in America. On Wednesday 19 April, Captain Tom Byrne brought news to Naas from GHQ in Dublin that a nationwide rising was to take place on Sunday 23 April using the Volunteers’ scheduled manoeuvres in Dublin as a cover. He was ordered to mobilise all the companies in the county and march to Bodenstown where they would assemble, blow-up the railway bridge at Sallins, to prevent military reinforcements reaching Dublin by train, and march on to the capital. All companies promised a good turnout. However, due to Eoin MacNeill’s countermanding order delivered by Éamonn Ó Modhráin (Ballysax), confusion reigned in County Kildare. Five Volunteer companies mobilised for action, but stood down when they received the countermanding order. The plans to blow up the railway bridge near Bodenstown failed and after waiting for some time for more Volunteers to turn up Captain Tom Byrne, Lt. Ted O’Kelly (Maynooth) and Tom Harris (Prosperous) made their way to the town of Maynooth. Here, Domhnall Ua Buachalla and Pat Colgan had re-mobilised their company, when they received word that the Rising had gone ahead in Dublin. Fifteen men walked from Maynooth to Dublin arriving at the General Post Office on Tuesday morning to be welcomed by Padraig Pearse and James Connolly. In the GPO, the Maynooth group found five more Kildare natives: Frank and Eva Burke (Carbury), Tom Brien (Timahoe), Michael Cowley (Kilbrook), and Jim O’Neill (Leixlip). Around the city more Kildare men and women were based in other rebel garrisons. As the crown forces reacted to the Rising, dozens more Kildare men arrived in the capital to quell the insurrection. The Irish regiments of the British army had many men from the Short Grass county in their ranks. Some of their first fatalities, included Captain Alfred Warmington (Naas), Private William Mulraney (Hodgestown, Donadea), and Private James Duffy (Kilteel) who had arrived in Dublin from Newbridge Barracks and the Curragh Camp. Robertstown man, Captain Harry de Courcy Wheeler, accompanied by Nurse Elizabeth O’Farrell, took the surrender document signed by Pearse, Connolly and Thomas MacDonogh to many of the rebel garrisons. The civilian inhabitants of Dublin suffered far higher casualties than either the rebels or crown forces. 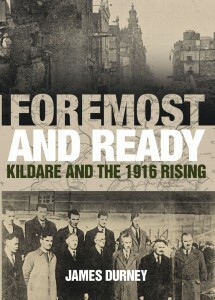 Among the first civilian casualties were men who had been born and raised in Kildare, but had made Dublin their home. Michael Kavanagh (Timahoe) was shot dead by rebels at a barricade in St. Stephen’s Green; Francis Salmon (Straffan) and Edward Murphy (Carnalway) were fatally shot by unknown snipers, while Peter Connolly (Celbridge) was bayonetted to death by British soldiers in North King Street. Outside of the capital there were only a few locations where action associated with the Rising occurred. In County Kildare, aside from the mobilisation of the Maynooth Company, a small railway section was destroyed near Athy in an attempt to disrupt communications. The subsequent execution of the leaders of the Rising awakened a generation to the cause of Irish freedom and the Kildare men of 1916, Domhnall Ua Buachalla, Tom Harris, Pat Colgan and Éamonn Ó Modhráin would play their part in the development of our nation. The men, women and children of Kildare, military and civilian, rightly deserve recognition in the future recording and commemoration of the story of 1916.